Fleet Street, on the fringes of the City, has to be one my favourite places to head to for an evening out with friends. Pubs like Ye Olde Cheshire Cheese, tucked away down a narrow alley, are oozing in character. Here you’ll find a maze of cosy rooms kept warm by authentic log burning fires and dim lighting evokes an era before electricity. Many Fleet Street pubs, Ye Olde Cheshire Cheese included, have real history to them and date from soon after the devastating Great Fire of London of 1666, amongst some of the first buildings to be constructed in the programme of re-development. But these pubs would be nothing without the people that drink in them, which along this stretch for much of the last three centuries has been dominated by newspaper journalists and printers. For Fleet Street is where, a little over 300 years ago, the media that dominates our lives today was born. This weekend I went on a new ‘immersive walking tour’ with Dr Matthew Green of Unreal City Audio tracing of the birth of the free press to this very area of London. 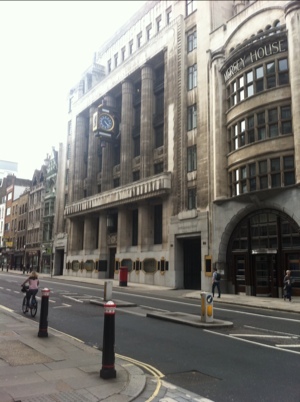 We saw where, in a building next to where the Leon fast food outlet is on Ludgate Circus today (at the City end of Fleet Street), the world’s first daily newspaper, the Daily Courant, was launched in 1702. Within less than 30 years there were a total of 31 newspapers in London with a combined weekly circulation of 100,00, most with their offices in the immediate vicinity of Fleet Street, establishing it as London’s media hub. Walking along this stretch today you can still familar names like the Telegraph and Express etched onto the side of buildings, remembering pre 1980s when newspaper companies dispersed to Wapping, Victoria and elsewhere in London. There are also numerous blue plaques with a media theme, remembering everything from famous journalists to the titles themselves, like the first ever Sunday newspaper, the Sunday Times. As with his excellent coffeehouse tour, Oxford-educated Dr Green, uses actors in period to introduce us to some colourful characters from the newspaper trade. Popping out from all manner of places (something old London is well suited to with its maze of courtyards and alleys) we meet the hawkers who sold the newspapers, newspaper proprietors and of course the journalists themselves, including the infamous Daniel Defoe. But the tours must be expensive to run (the walk this weekend involved eight people, including actors and musicians). Building on an excellent article he wrote for the Telegraph recently, Dr Green presents a fascinating picture on the walk of newspapers in 18th century London, where editors put spin on stories collated by journalists overhearing conversations in coffeehouses and taverns to outdo their rivals. They ran with rumours that could not be substantiated and some even admitted to actually making stories in a bid to create a paper that would sell. It’s fitting that the tour started from the site of a revolutionary printing press opened by Wynkyn De Worde in 1495 just off St Paul’s Churchyard. He is seen as ‘the Father of Fleet Street’, printing books on a range of subjects and for a wide audience for the first time (prior to him the likes of William Caxton, of whom De Worde inherited his printing business when he died, had produced only expensive books for Royals and nobles). De Worde was also the first person to open up a book stall in St Paul’s churchyard. There was of course at the time heavy censorship for those that followed in the footsteps of Wynkyn De Worde and right through the 16th and 17th century those that didn’t comply were severely punished with the death penalty. Dr Green’s walk features the government censor Sir Richard l’Estrange and some of the poor victims who failed to adhere to law. The year 1695 was a turning point because then, as a result of mistrust of rival political parties the Whigs and Tories, press censorship was ended. Although journalists were still punished on occasions for the copy they wrote in the years that followed (when it was seen as against national security for example), this change in legislation really was a revolutionary moment for the British media and directly influenced that wave of newspaper launches that followed the Daily Courant. Squeezing so much fascinating history into a single 90 minute tour is a tough ask and the walk that we went on overran by some margin (not that anyone seemed to mind and it was also the ‘world preview’!). The story of the birth of newspapers even pre censorship and before the launch of the Daily Courant in 1702 could fill a walk on its own. Dr Green and has created a unique way of running walking tours which brings subjects, like coffeehouses and media history, to life. Guides can often resort to assembling a confusing mass of facts on numerous different tops, but this is focussed narrative history at its best. I’ll certainly be recomending this walk to friends when I am next out in the pubs on Fleet Street. I was also on the walk and agree with your assessment that it was very enjoyable and informative, Mark. I have one quibble, which is that the content of the tour seemed rather down on present day media, casting aspertions about our current press. Today’s media has many serious weaknesses but I think considering it in the context of British media history highlights some more interesting lessons than those which were indicated in the talk. Also, does anyone know if there are any Fleet St area printing rooms intact today?